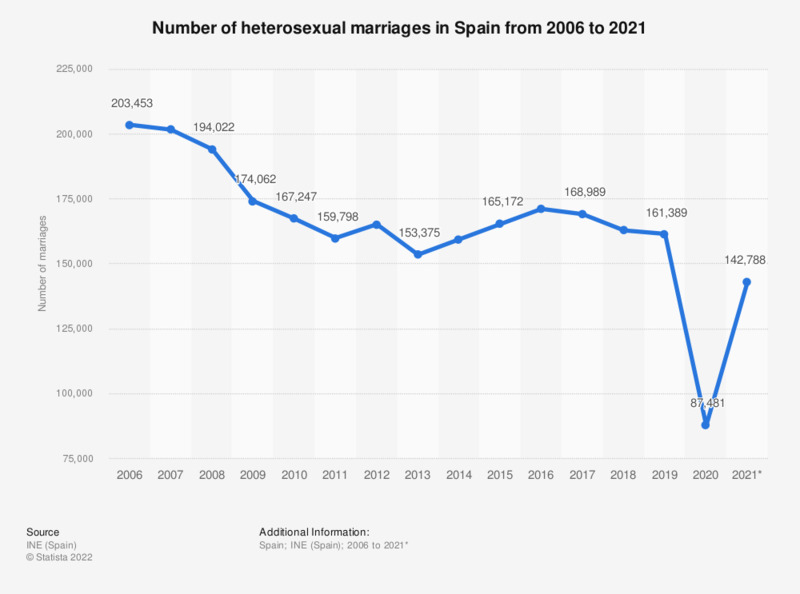 This statistic displays the number of opposite-gender marriages in Spain from 2006 to 2017. During the period of time under consideration, the highest peak took place in 2006, with a total number of approximately 203 thousand heterosexual unions. The tendency in the upcoming years was downward, and the lowest point was reached in 2013, with figures showing a number of 153 thousand opposite-gender unions. These numbers picked up in the following years and stood at approximately 171 thousand heterosexual marriages in 2017. Spain's age at first marriage is one of the highest in Europe, with a national average of 37.82 years old for men and 35.01 for women.